Enjoy resort-style living in this FULLY FURNISHED home with WEST facing POOL and PREMIUM LUSH CONSERVATION views in the desirable SANDY RIDGE! Fall in love with custom designed freshly painted EXTENDED SCREENED POOL DECK with COVERED LANAI, UPGRADED RAISED SPA and sparkling PRIVATE POOL where family and friends come together to relax and to socialize.Featuring sought after SINGLE STORY FLOOR PLAN with TWO PRIVATE SUITES, this residence makes profitable income producing property within just a short drive to Disney, great second home in the heart of rapidly growing area or a full-time family residence with cozy and comfortable living spaces. Fully equipped KITCHEN is featuring AMPLE COUNTER TOP space with convenient BREAKFAST BAR and separate DINETTE area, all major kitchenware and appliances for pleasant cooking experience. Functional OPEN LAYOUT showcases deep VAULTED CEILINGS and abundance of natural light inside. All bedrooms are tastefully furnished to maximize rental income, conveniently located bathrooms are featuring 2 WALK IN SHOWERS and 1 Soaking TUB to meet all family needs, LARGE WALK IN CLOSET in the master suite. LIGHT FIXTURES with ceiling FANS, HOME DECOR tastefully placed throughout the home. NEW WASHER(2018), WATER HEATER(2018), RAIN BIRD Controller (2018).The HOA fees include basic CABLE and LAWN CARE. 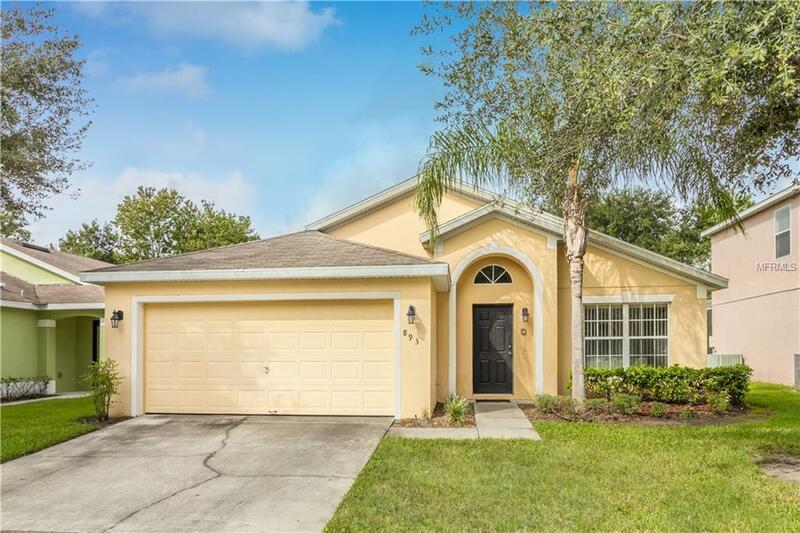 This is a lovely turn key home - we welcome you to schedule private showing and check it out!